Thanks for these schematics!! Don’t know if I’ll ever know how to use them, but it’s sure great to have! If possible, can you please tell me the history of my farfisa duo compact organ. It does have the serial A-6008-92. My interest is year of production, etc. There is no way to date them by the serial numbers that I know about, unless there is a date on a piece of paper inside. Most likely 67-69. 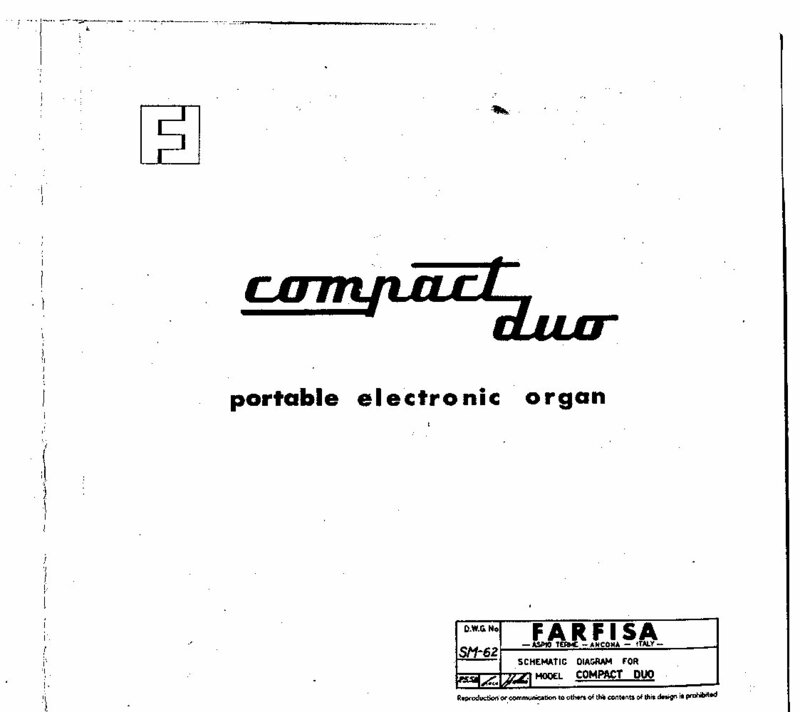 Hi, have you any idea what the price was for a Farfisa Compact duo organ in 1967/8 please? even an approx would help. I need this info for a College course I’m doing. Serial 6420 /327. I am doing a repair in a church. I really appreciate your help! Hi, can anyone help me find, or send a copy of a schematic for a Farfisa Partner 15 Bravo, Model# 112457, serial 6303/276 R ? Hi! Can any one help me find the schematics for a Farfisa Organ Model 112467?? Hello, I have another schematic scan witch are better. I can read capacitor value and I can give you them. Simon, could you send those to me? Do you also have the F/AR unit’s schematics? Please send it to [email protected]. I am trying to repair one of those. You help is most abliged. Thank you for your site and info FARFISA.ORG! !